Politics, mostly. And American empire. And yet, for the past 30 years, the relationship has been punctuated by a series of spectacular fights — a gruesome tussle over ideology in 1986’s graphic novel Batman: The Dark Knight Returns, a dramatic dust-up due to mind control in the 2003 comic-book story line “Hush,” and, of course, an upcoming gladiator match in this weekend’s big-screen tentpole Batman v Superman: Dawn of Justice. At this point, nobody really remembers that early, sunny friendship — when it comes to superheroes, pure friendship’s boring. Batman and Superman are both, of course, good guys, but what we so often want to see is them fighting. Which leads us to “day versus night.” Superman has faith that humanity will tend toward goodness if you give it trust and hope; Batman lacks that faith and believes the world only gets in line if you grab it by the throat and never let go. The former spends his contemplative moments hoping for the best; the latter spends those moments vigilantly preparing for the worst. But this contrast isn’t just characterological; it’s also historical. The icons were created almost simultaneously, but Superman is unmistakably a figure of his early years — the 1940s and 1950s, an era of buoyant, blinkered wartime and postwar consensus (at least as it might have been felt by most white, boyish comic-book readers), when it seemed appropriate to deploy a godlike do-gooder to do things like help cats out of trees or return purses to de-pursed Metropolis women. (One of his early nicknames was the Man of Tomorrow, after all.) Batman came of age later, beginning in the 1970s, the era of American malaise and urban decay, using cynicism as a weapon for good and training his sights on a Gotham City so broken it often looked like a war zone (often fighting super-criminals who hoped not just to plunder the city but overturn any lingering faith its denizens had in the virtue of compassion and social order). Which of these two worldviews provides the better way to live a good and productive life? You can do both, of course — just as you can love both characters and write them in such a way where they get along with one another. But readers don’t just want that — readers want to see the conflict. And, in a real-world sense, most of them are on one side. Today, Batman is a far more popular character than Superman, and he typically wins whenever they go toe-to-toe in a story — which is, of course, ridiculous, considering he’s just an earthling, but that only makes it all the more remarkable as a reflection of reader preferences and prejudices. Outside of comics and movies, too, his worldview predominates, in the form of a perennially apocalyptic vision of the near future. In all ways, Batman is winning in the battle of Batman vs. Superman, which is especially strange given how little New York today, say, looks like the Gotham of The Dark Knight Returns. But we’ve been living so long in Batman’s universe that it can be hard to remember his worldview didn’t always have the upper hand. Photo: Frank Miller’s Batman: the Dark Knight Returns No. 4, 1986. He was also an instant sensation. DC Comics knew it had a hit on its hands, but wanted a bigger one — which means they needed their star to be as family-friendly as possible. As comics historian Gerard Jones recounts in his chronicle of the era, Men of Tomorrow: Geeks, Gangsters, and the Birth of the Comic Book, DC exec Jack Liebowitz saw the nascent Man of Steel as “something that could be built and sustained here, a kind of entertainment that kids liked better than pulps and would continue to if given reason to keep coming back.” Accordingly, in 1940, he and editor Whitney Ellsworth drew up a pristine code of conduct for superheroes that, among other tenets, forbade DC heroes from knowingly killing. It was not unlike the onset of the Hays Code in Hollywood, and by the time U.S. soldiers were being sent off to war in 1942, Superman had become cheery, lovable, and status quo-respecting. Those were not adjectives you could use to describe the initial depictions of Batman. He was first published in DC’s 1939 comic Detective Comics No. 27, the creation of Bob Kane and Bill Finger. At first, he was a “weird figure of the dark” and an “avenger of evil,” as one of the early stories put it. Unlike Superman, he had no special powers other than being exceedingly wealthy. He was more or less a rip-off of pulp hero The Shadow and spent his time in the darkness, attacking — and occasionally even murdering — evildoers. But, like Superman, he was also an instant smash — which meant the same image-buffering fate. In his new history of Batman, The Caped Crusade: Batman and the Rise of Nerd Culture, Weldon tells of newspaper editorials and church bulletins railing against dark, violent comic books. As a result, the editorial leadership pushed Batman out of the shadows, making him brighter and poppier, and even turning the weird loner into a kind of doting father figure to a scrappy young ward named Robin (a relationship that could’ve really gotten dark and weird in different hands). “Adding Robin was no mere cosmetic tweak,” writes Weldon, “it was a fundamental and permanent change that placed Batman in a new role of protector and provider.” He stopped killing. He worked cheerfully with the Gotham police. He walked around in broad daylight. The Batman and Superman brands were more or less in sync. Of course, Superman was a much more natural family-friendly sell than Batman, because comics writers couldn’t quite eliminate all of the darkness from the character of the Dark Knight, as later they’d have trouble trying to turn Superman into something approaching an antihero: One of these characters was a benevolently powerful space-god, the other a weirdo orphan wearing bat ears. This probably, at least in part, explains Superman’s bigger stature through the 1940s — his persona was a near-perfect vessel for imperious American confidence and social order. But Batman had his clean-cut pitch, too: He may not have had superpowers, but he was a kind of icon of self-improvement, since he had willed himself to reach the peak of human physical potential (well, willed and spent) and had fought a delightful gallery of enemies. Oddly enough, it took DC a long time to figure out that these guys were two great tastes that could taste great together. 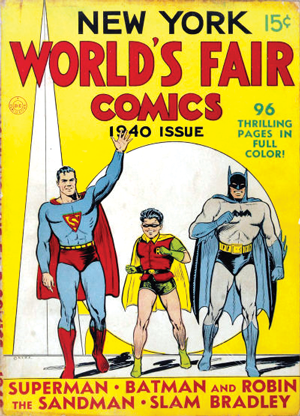 Superman and Batman first appeared in an image together on the cover of a 1940 promotional tie-in comic for that year’s World’s Fair, but the interior pages showed no story where the two of them interacted. In 1941, there was a comic in which they stood side by side to help with a fund-raising drive for war orphans, but they had no dialogue with each other. 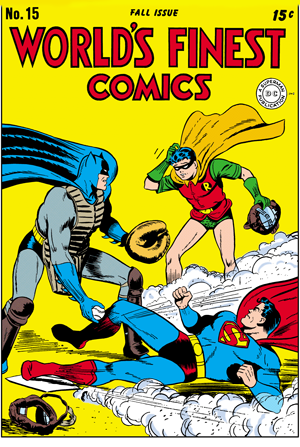 That same year, they started appearing alongside one another on the covers of a new comics series called World’s Finest, and on those covers, you saw them wordlessly playing baseball or going skiing — but once you opened the comic, you saw no stories where they actually hung out. Our two legends have been crossing paths, in nuanced and shifting ways, for more than 70 years. 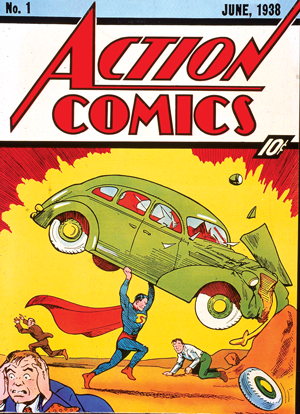 1938 Superman debuts in Action Comics No. 1. In his early stories, he’s a bully toward evildoers. Within a few years, he loses the bully aspect and goes full good guy. 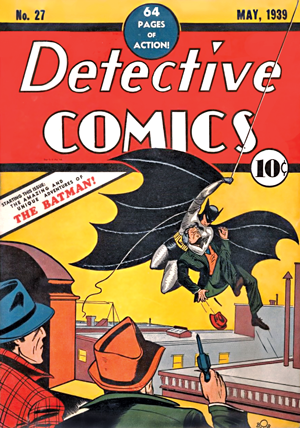 1939 Batman debuts in Detective Comics No. 27. He’s initially a dark avenger of the night (and mostly a rip-off of pulp hero the Shadow), but after about a year, publisher Detective Comics (later DC) opts to make him more family-friendly. 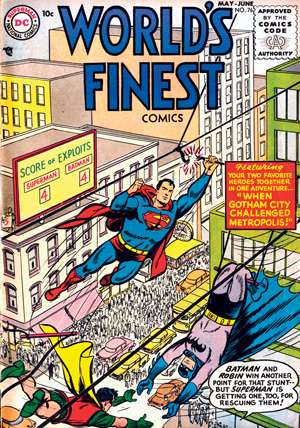 1940 Superman and Batman make their first joint appearance in an image: the cover of a commemorative comic for the New York World’s Fair. They don’t interact in the stories contained within. 1941 The pair make a brief cameo together in All-Star Comics No. 7 but don’t exchange any dialogue—they just help out with a fund-raising drive for war orphans. 1945 The initial Batman-Superman crossover occurs on an installment of the hit “Adventures of Superman” radio drama, in which Superman helps Batman after the latter is turned into a wax statue. It’s the first of many collegial team-ups on the show. 1952 They make their first crossover in a comic book: Superman No. 76. Bruce Wayne and Clark Kent get caught changing into costume. They happily agree to keep each other’s identity secret. 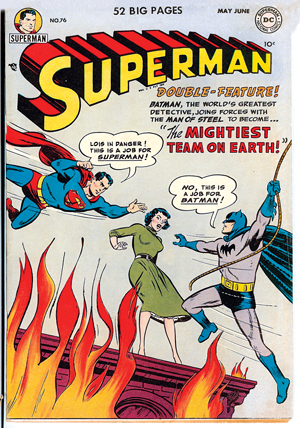 1955 The pair have their first conflict of any kind in World’s Finest No. 76, but it’s just a friendly contest. They compete to determine whether Gotham City or Metropolis will host an electronics convention. 1958 The heroes have their first proper fight in World’s Finest No. 95. 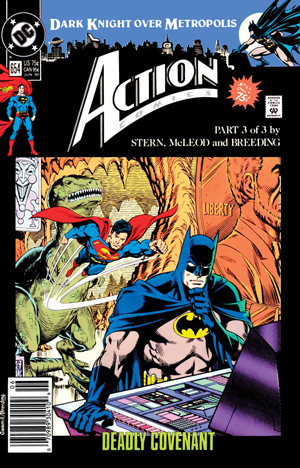 Under the influence of aliens, the two come to blows before the effect is reversed, and set a precedent: Seeing Batman and Superman fight can bring unique thrills to the comic page. For the next decade or so, Superman and Batman have flare-ups, but not, like later, because of divergent ethical codes. 1968 CBS debuts The Batman/Superman Hour, an animated series starring the two characters in separate adventures. It’s canceled the next year. 1969 Writer Denny O’Neil and artist Neal Adams start doing Batman and give it a darker tone than anything audiences had seen with the Caped Crusader since 1940. The character gets more brooding during the ensuing decade. Meanwhile, Superman stories start meditating on the morality of one being having omnipotent strength. 1973 ABC debuts Super Friends, an animated series about top-tier DC Comics heroes fighting evil together. It runs under various names until 1986. Batman and Superman are lead characters, and their relationship is mostly chummy, even as their comics incarnations are getting grimmer. 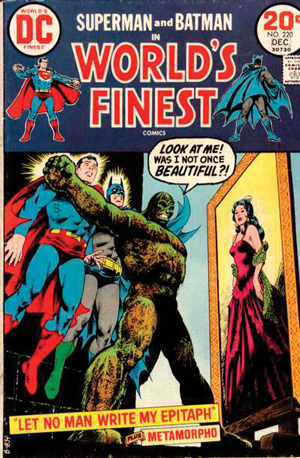 1973 In World’s Finest No. 220, Batman says the wholesome Superman can’t understand a particular villain’s desire for vengeance. This kind of tension becomes more and more common throughout the decade. 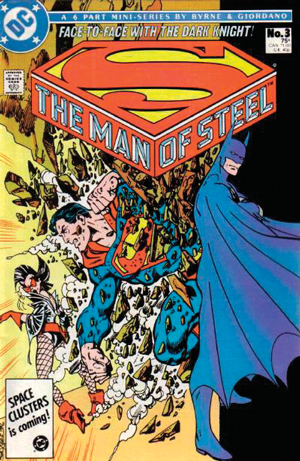 1985 The DC universe is rebooted and the new version of Superman and Batman’s first meeting is one in which the two are initially wary of each other: Superman thinks Batman is a criminal vigilante; Batman distrusts Superman’s power and, as he’s wont to do, prepares a fail-safe plan in case the Man of Steel tries to take him on. 1986 History’s most famous Batman-Superman fight occurs in writer-artist Frank Miller’s legendary dystopian-future tale The Dark Knight Returns. Miller depicts Supes as a Reaganite government stooge and Bats as a tough-minded libertarian. Batman wins through clever use of battle armor and, of course, Kryptonite. 1990 Superman gives Batman a ring made of Kryptonite, to be used in case he ever gets mind-controlled. 1996 The Kingdom Come comic finds our duo sparring over who should safeguard the world (humans or superhumans). The two reconcile, and Batman agrees to be godfather to Superman’s child. 2000 The Justice League tale “Tower of Babel” reveals that Batman has plans to take out every member of the League should they ever go rogue—including Superman. 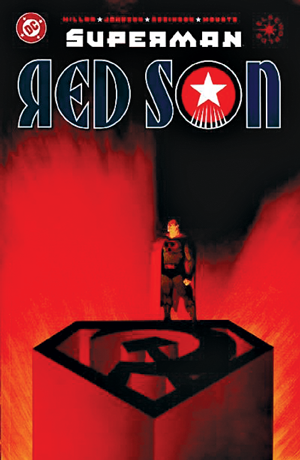 2003 Writer Mark Millar pens a hit comics mini-series called Superman: Red Son that imagines the title character as a Soviet. 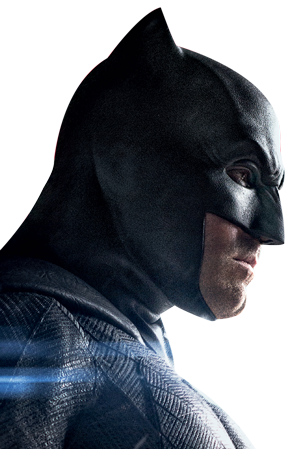 In it, a Russian anarchist Batman beats the crap out of Superman. The story further cements the notion that the former could act as a check on the latter. 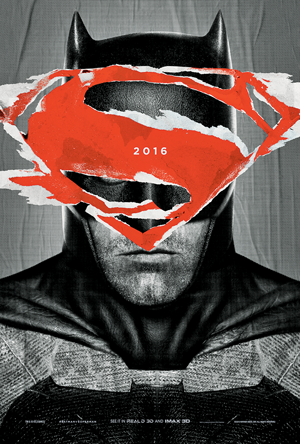 2016 Batman v Superman: Dawn of Justice debuts. Their fight will stem from Batman’s long-held belief that no one should have as much power as Superman. Superhero fiction has been a trans-media enterprise for longer than many give it credit for, and the genius notion of having Batman and Superman actually solve crimes together — as opposed to just convention-bid in tandem — apparently didn’t materialize until a 1945 episode of Superman’s spin-off radio show, The Adventures of Superman. Their first printed co-narrative came in Superman No. 76, published in 1952. There, Bruce Wayne and Clark Kent — who had no knowledge of each other’s secret superhero-ing — found themselves in the same cabin on a cruise ship. When some criminals start a massive fire, Bruce turns out the cabin’s light to change into his costume, and Clark takes the opportunity to do the same. But suddenly, they get caught in the act by light from the flames passing through the porthole. “Why — why, you’re Superman!” Batman exclaims. “And you, Bruce Wayne … you’re Batman!” Superman counters. “No time to talk this over now, Superman!” Batman says as they rush out of the cabin. Superman may be strong, but Batman has two advantages: wealth and paranoia. Their ensuing adventure set a template for the way they’d interact for the next 20-odd years: They complete each other and accentuate each other’s different power-sets while having the same squeaky-clean tone and goals. Readers rarely saw a true ideological conflict between the two, and Batman subscribed to the Superman-ish notion that good can always triumph over evil, so long as we live clean lives and partner up with fellow do-gooders. The only difference between them was their skill sets. “They had Batman be the master technician and Superman be the big jock,” says Weldon. “Batman would be the ultimate brain and Superman would come over to Gotham for help on a case because It’s just too hard for me to figure!” Occasionally, the two would have friendly contests (for example, No. 76 saw them performing feats of strength to win their respective cities the right to host an electronics convention), and they would occasionally challenge each other for the betterment of each (in No. 149, Batman and Superman each use an amnesia machine on themselves so they can try to re-discover each other’s secret identities). There were also real conflicts, though typically they unfolded under odd circumstances. “The logic of that time was heavily driven by covers,” says comics historian and longtime DC executive Paul Levitz. You wanted to grab lucrative young eyeballs with insane vignettes on the front of a comic book and “two heroes fighting was a classically successful cover.” The story on the inside was of secondary importance, largely built up to satisfy what was on the front. Irwin Donenfeld, the executive vice president of DC throughout much of the late ’50s and early ’60s, was particularly fond of this tactic, so you got nutso covers like that of World’s Finest No. 109, in which a flying (!) 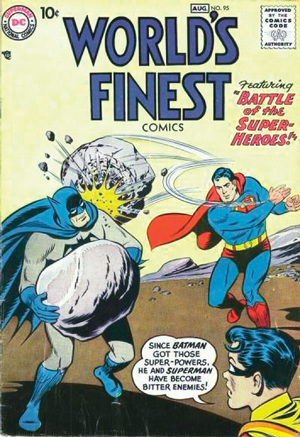 Batman throws a massive cinderblock at Superman while a horrified Robin gazes at them and thinks to himself, The sorcerer’s spell that’s been cast over Batman is forcing him to fight Superman — and now he has super-powers to do it with! Such stories satisfied a fannish desire to see the two fight, but what made them even more exciting was how perverse they were — there’s no way, after all, that these two would ever really have a problem with one another, right? And, whatever the fun of seeing them fight, you never had to worry too much about a permanent rupture: There was always some wacky explanation, like mind control, mistaken identity, or simply explaining that the tale was an “imaginary story,” wholly removed from normal continuity. The chummy status quo would always return by the next issue. The gods were in their heaven, all was right with the world. Where, Exactly, Are Gotham and Metropolis Supposed to Be? 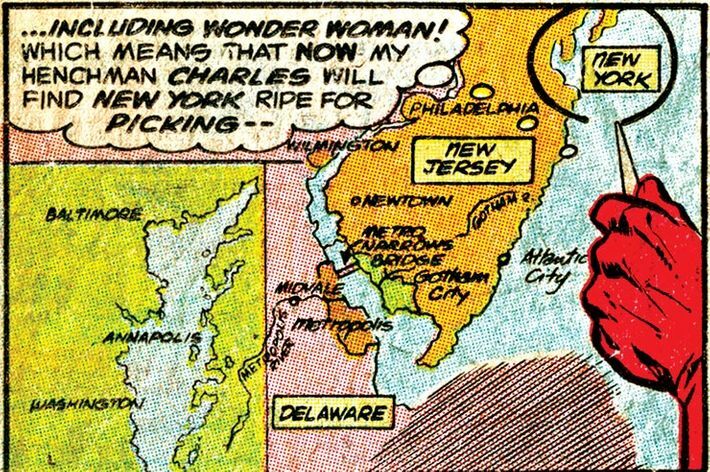 The answers have often been left ambiguous, but a map in a 1990 official DC publication placed Gotham in southwestern New Jersey and Metropolis in northeastern Delaware. Dawn of Justice director Zack Snyder has said his Gotham and Metropolis are “sister cities across a big bay … like Oakland and San Francisco, kind of.” If he still means for them to be on the East Coast, that jibes with a 1978 DC map wherein Gotham is in roughly the same spot as Fairfield Township, New Jersey, and Metropolis aligns with Dover, Delaware. Around 2001, Warner Bros. was wowed by a Batman-versus-Superman screenplay from Se7en screenwriter Andrew Kevin Walker and hired A Beautiful Mind scribe Akiva Goldsman for a polish. The plot for the film featured Lex Luthor tricking Batman into blaming Superman for the death of the former’s wife. Air Force One’s director, Wolfgang Petersen, was hired, but the project was killed in August 2002 after execs opted instead to fund a Superman solo movie written by J. J. Abrams. That movie, too, was eventually abandoned. When Goldsman worked on 2007’s I Am Legend, he asked director Francis Lawrence to include a fake poster for his unmade film. 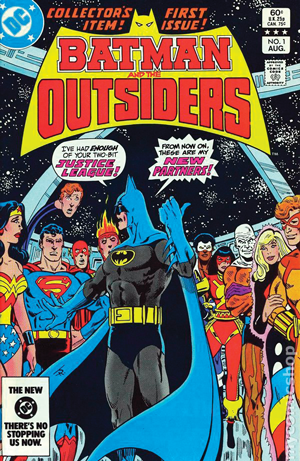 It was only in the ’70s and ’80s that Batman truly emerged from Superman’s shadow, and it’s hard to avoid the impression that the Dark Knight was a product of that time (just as Superman was a product of the mid-century). This was a period shadowed by the assassinations of two Superman-like symbols of hope — Robert F. Kennedy and Martin Luther King, Jr. Cities from coast to coast erupted into vicious race riots. A sitting president was tied to an insidious crime and resigned on live television. We lost a war for the first time and the economy skidded into an oil-slicked slowdown. At the cinema, audiences wanted heroes that were less like John Wayne and more like Dirty Harry. Batman was a much more natural icon of 1970s angst and anomie, but the darker turn in comics also came to Metropolis, where Superman’s virtues — once taken as self-evident — were being questioned in his own stories. O’Neil was brought on to write Superman tales, too, and felt it was no longer interesting to read about a perfect man who did only good. “The essence of fantasy melodrama is conflict,” O’Neil says. “You’ve got a guy who, at his strongest and most powerful, could blow out a sun! How are you going to create conflict for that guy?” DC’s leadership agreed. Through various in-story machinations, his powers were weakened for a while. But more important, doubting Superman became the order of the day. A 1972 tale penned by Elliot S. Maggin was boldly titled “Must There Be a Superman?” and saw the Man of Tomorrow realizing that he can’t fix structural problems like poverty and oppression. “You stand so proud, Superman,” read the opening narration, “in your strength and your power — with a pride that has found its way into the soul of every man who has stood above other men! But as with all men of power, you must eventually question yourself and your use of that power.” Wait, were we talking about Kal-El of Krypton, or the United States of America? The result was, indeed, steeped in primal fear. In The Dark Knight Returns, an aging Bruce comes out of retirement and goes on a Death Wish-esque crusade to clean up the streets by any means necessary. He has also come to hate the sunshiny outlook of Superman, a figure who — in Miller’s depiction — has a naïve faith that it’s morning in America. Miller’s Superman has made a Faustian pact with the government, taking orders from President Reagan. (Well, he’s not technically called Reagan, but any reader will recognize the fictional commander-in-chief’s wrinkled smile and folksy chatter.) “I gave them my obedience,” Clark thinks to himself while destroying some Soviet weaponry. “No, I don’t like it. But I get to save lives — and the media stays quiet.” When Batman leads an army of vigilantes during a night of chaos in Gotham, Superman is ordered to take down his erstwhile ally. But let’s get back to The Dark Knight Returns. “In political terms, Superman would be a conservative and Batman would be a radical,” Miller said when I interviewed him a few months ago. Miller himself identifies as a libertarian, so his protagonist’s distrust of power makes all the sense in the world. But the political question of the book is, in my view, only a symptom of a larger philosophical matter. This Batman is utterly without faith in anything beyond his immediate control. Sure, he can trust his butler, his sidekick, and his weaponry — but that’s about it. Everyone and everything else needs to be throttled and bent into shape, in order to wrestle with a world otherwise almost beyond repair. What’s more, Batman hates Superman because Superman does have faith: faith in the government, faith in Reaganite prosperity, faith that Batman might be able to see reason and give up. In Batman’s eyes, these are failings. No one had ever before attempted to show these two being in such opposition, and so filled with bloodlust. But the crazy experiment was a massive success. For the first time, Batman comics started consistently outselling Superman ones, but the transformation went beyond mere sales. “It’s difficult to overstate the influence The Dark Knight Returns has had on comics and the culture that has risen around them,” Weldon writes. Thanks to Miller, the vision of Batman as a pitch-black bruiser and schemer was carved into the rock of superhero fandom. 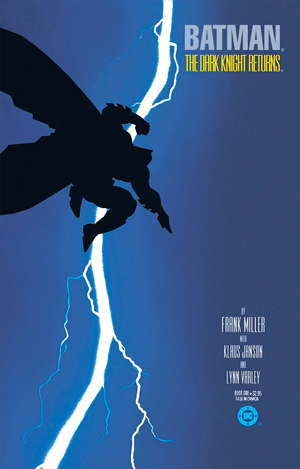 In 1989, Tim Burton’s Batmanhit theaters and, while it lacked the deep gothic mood of later screen hits like the influential Batman: The Animated Series and Christopher Nolan films that followed, it offered many of the dark, angry pleasures that Dark Knight Returns had surfaced — and it was a box-office smash unlike anything a DC character had ever seen. Very few tales since then have dared to put the two heroes so viciously at odds as they were in Dark Knight, but every story of conflict since is shadowed by Miller’s and Byrne’s characterizations. In 1988’s Batman story line “A Death in the Family” — written by Jim Starlin and drawn by Jim Aparo — Robin is brutally murdered by the Joker and a complicated diplomatic situation makes any Bat-revenge legally tricky. Clark flies in to tell Bruce to stay in line: “There’s nothing you can do here,” he says. 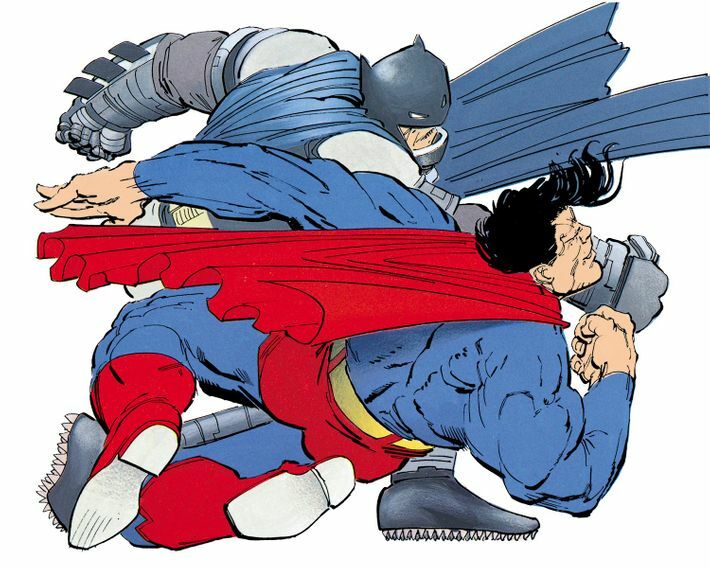 Bruce fires off a massive punch to Clark’s jaw, which of course doesn’t even bruise the Man of Steel. “Feel better now?” Superman asks, frowning. Even when they got along, after Dark Knight, there was often a steely sense that things could go awry between them. A 1990 Batman-Superman crossover story called “Dark Knight Over Metropolis” dealt with the theft of a ring made out of Kryptonite, and at the end, Supes opts to give the ring to Batsy for safekeeping, just in case someone evil ever takes over Superman’s mind and he needs to be taken down. “I want the means to stop me,” Clark says, “to be in the hands of a man I can trust with my life.” It’s a sweet moment, but also a grim one. Indeed, for all the talk of trust, Superman was dourly preparing for the worst and acting out of fear. In other words, much as Batman had acted like Superman in the middle of the century, we had somehow entered a world where Superman was acting like Batman. Perhaps more important, the Batman mentality — paranoid, fatalistic, violent — was setting the pace for superhero fiction generally. Superman was killed by a rampaging monster in 1992. One year later, a brutal villain snapped Bruce Wayne’s spine, and a younger, more vicious successor took over the Bat-mantle. Superman came back from the dead and the original Batman took back the cape and cowl, but they still fought increasingly apocalyptic threats that required harsh pragmatism to beat. The best-selling comics across the industry in the early- to mid-’90s were violent and oozing with themes as dark as the colors. America wasn’t as decrepit and frightening as it had been in prior decades, especially in its cities, but in an age of increasing cynicism, Batman felt far more au courant than the Metropolis Marvel. As a new century dawned, conflicts between the two became more frequent in comics and, in nearly every one, Batman kept winning. It’s a nice rhetorical flourish, but in the real world, Batman iswinning. Not only do creators nowadays think stories work better when he comes out on top, but he also outsells Superman on the comics stands and — much more important — at the box office. Way back in the earliest days of big-budget superhero filmmaking, 1978’s Superman: The Movie was a sensation — but its sequels showed massively declining returns and that incarnation of the franchise was canned after 1987’s loathed Superman IV: The Quest for Peace. Two years later, Batman struck big with the aforementioned Burton flick, which got two hit sequels: 1992’s Batman Returns and 1995’s Batman Forever. The failure of 1997’s Batman & Robin put DC Comics-based movies in the wilderness for a while, but it was Batman who led them back to the Promised Land. Christopher Nolan’s Batman Beginshit theaters in 2005 and was a surprise critical success, but the real action came with its two sequels. The Dark Knight and The Dark Knight Rises each made more than a billion dollars worldwide — numbers that were unthinkable for a superhero flick just a decade earlier. As many film critics noted, in the age of the War on Terror, this Batman seemed to be the hero we deserved. Superman, on the other hand, couldn’t get airborne. Bryan Singer’s Superman Returnshit theaters in 2006 and it was as sunny, colorful, and hopeful as you’d want a Superman story to be. But Warner Bros. was disappointed in its performance and cancelled plans for a sequel. After years of failed proposals, a new Superman movie finally hit theaters in 2013: Zack Snyder’s Man of Steel. It was a hit, raking in $668 million worldwide and giving Warner the confidence to use it as the starting point for its new DC Comics-based “shared universe” of interconnected films, the next of which is Batman v Superman. 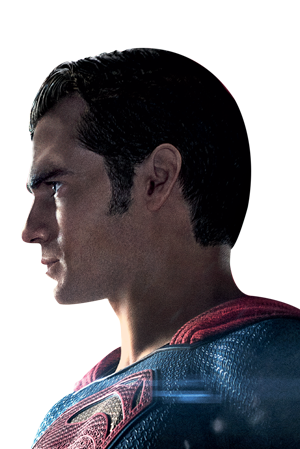 But at what price to his soul did Superman get this box-office victory? Man of Steel is a very dark movie. The visuals play out with gritty, color-drained filters. Superman spends much of the movie moping over a dead parent and wondering what the point of everything is. In the end, he has a horrifically violent battle with a fellow Kryptonian that levels Metropolis. He even grimly concludes that the only way to end that fight is to kill his rival (something the comics versions of Superman and Batman never do). The whole endeavor shows us a Superman who is brooding, angry, and pessimistic. In other words, it seems like the only way to do a successful Superman movie is to make it feel like a Batman movie. With Batman v Superman, they’ve just made another one. The Batman perspective has some things going for it, of course: The world can indeed look pretty dark, as our collective anxieties and casually apocalyptic political mood testify daily. But it is also not the 1970s or ’80s anymore, and new threats like ISIS and climate change aside, the urban hellscapes which gave rise to the Dark Knight are distant memories at this point. Which does make you wonder: How much is the cynicism of Batman a logical response to a terrifying future, and how much a self-perpetuating worldview with a locomotive logic of its own? And then there’s the cost to comic-book narrative: If Batman and Superman are going to keep fighting, could we maybe let the Man of Steel win? Because if the political worldview of superhero fiction is going to hang in the balance with each battle, the least we could ask for is a little genuine suspense about which one of the do-gooders is going to come out on top. *A version of this article appears in the March 21, 2016 issue of New York Magazine.